There’s something refreshing about attending a play put on by a smaller theater company. Larger productions can certainly be dazzling, yet they can also feel a trifle overproduced. The expensive sets, the slickly tailored costumes, the perfect sound and effects can actually distance an audience from the immediate experience, and the show becomes more akin to television—something experienced at an emotional remove. Not so with 20% Theater Company’s world premier of The Terror Fantastic by Nicole Jost at the Crane Theater in Minneapolis. Here is theater in the raw: intimate, in your face, and occasionally serendipitous. 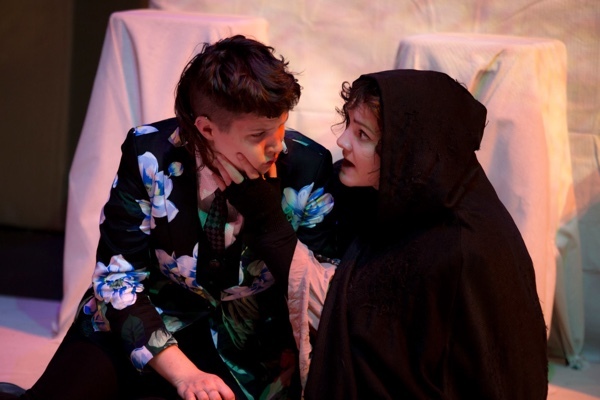 Terror explores the debilitating effects of depression and anxiety on the life of Isabella, or Iz (Addison Sharpe). A struggling writer, Iz invites old college friend Floyd (Aaron Konigsmark) to be their roommate. Iz could use the money, because their depression and anxieties have become so debilitating that they are having trouble holding down jobs, or even leaving the house. Their only respite is inside a fantasy world of their own creation, where they are a dashing princess—and where their fears cannot reach them. Their fears manifest themselves as a slinking Monster (Hillary Olson) who follows Iz around in their daily life, holding them back and coloring their perception of those they encounter. The way in which she stalked Iz throughout the performance was genuinely unsettling, as she oozed around and over both the set and the actors. Her continual serpent-like motion—even when she was simply waiting to come to the fore—lent an air of threatening omnipresence. The Terror Fantastic depicts well the ways depression and anxiety can negatively impact a person’s life, so much so that it felt most effective when Iz is simply seen as an everywoman. The play is framed as an exploration of depression’s especially pernicious effect on the LGBTIA community, but the element of sexual orientation seemed at times to be simply tacked on. 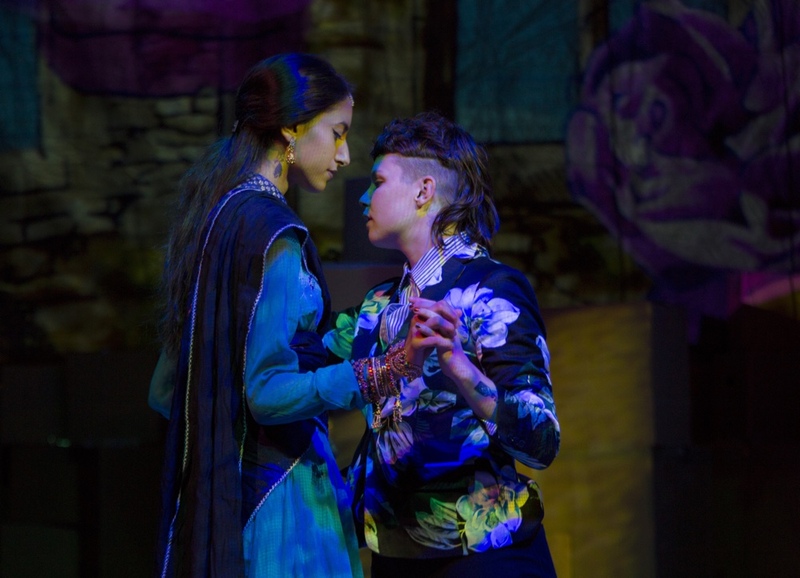 Much of the framing of Iz’s queerness felt somewhat dated, as if the playwright was attempting to fight old battles. There is an implication that Iz’s anxiety is a result of their trying to live a normal life in a frequently hostile world—yet the scenes in which that was purportedly shown were inconclusive as to whether they happened in truth or were just a result of their fear and depression coloring what they experienced. As the play goes on, Iz spends more time in their fantasy world, and the plot becomes somewhat muddled. Their fantasy started off as exactly that: a dream world in which they are confident and in control. At several points, early on, they stop another character in midsentence in order to make some dialogue alternations. However, later on, they appear just as caught up in the fantasy as the others, and their control vanishes. A valid point, when illustrating how depression filters everything, but as several scenes in the fantasy did not even contain Iz at all, it felt as if the fantasy world had started to overwhelm its own dramatic purpose. While director Shalee Mae Coleman presented a competent production, there were a few nits to pick. Iz’s physical mannerisms began to come off as somewhat affected by the end of the performance, for example. Then there was a choreographed sword fight that failed to really feel either convincingly real or instructively metaphorical. I blame the sword. Having been in such productions myself, frequently the feeling is “Cool, we have a real sword! Let’s use it!” However, the problem then becomes using it proficiently and safely. Slow-motion swings that do not connect, parries performed with a hand—these are distracting enough that it raises the question of why the production uses a real blade at all. It might have been better served with a fake blade that could have been wielded more convincingly. Deserving of mention is Kassia Lisinski, the sound designer. From the musical accompaniment that preceded and then smoothly segued into the performance to the truly unnerving sounds underlining Iz’s mental breaks, the sound was a solid addition that went a long to way to filling out the play’s world. Overall, it was enjoyable and affecting. While I didn’t feel it reached all the goals for which it grasped, it made a solid attempt and is well worth watching. The Terror Fantastic is at the Crane Theater Thursdays through Saturdays at 7:30 p.m. and Sundays at 2:00 p.m., now through December 16. Just FYI – it is NOT a real sword! 🙂 It looks pretty real, tho, but it’s not… We appreciate you coming to review the show, and for your feedback, and respect your feelings about the sword fight – however your assumption that the sword is real is actually false.